Sean Kelly is delighted to announce a major exhibition of new work by Wolfgang Laib, his first since joining the Gallery. The opening will take place on Thursday, September 6th from 6pm until 8pm. The artist will be present. 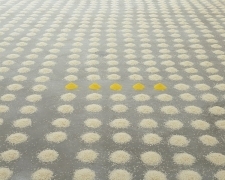 "Without Time-Without Body-Without Place" is organized around one of Laib's most important new, large-scale pollen and rice installations. 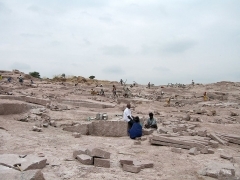 The exhibition also contains a monumental double staircase, new black and red houses of Indian granite, and wax sculptures. 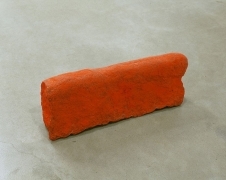 Wolfgang Laib is, without question, one of the seminal artists of our time. He lives and works closely with the cycles of nature and his preferred materials include milk, pollen, rice, wax and marble. His installations utilize ancient, elemental forms such as cones and ziggurats. 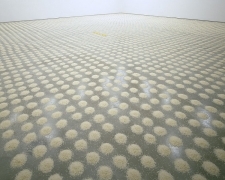 Laib's forms and artistic processes are intuitive, pure and universally resonant. Laib says of his work, "all are basically concerned with one and the same thing: with a journey, with the concurrence of motion and stillness, of material and immaterial, of the durable and the ephemeral, with balance and transformation, with the attempt to explore the irrational or the impossible, and with the search for an entrance or a passage to another world." Laib's work emphasizes art's spiritual dimension and in doing so, demands an intellectual as well as an emotional response. 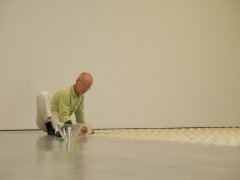 Wolfgang Laib (b. 1950) studied medicine at the University of Tübingen while concurrently attending lectures in art history, philosophy, psychology and Oriental philology. He also studied Indology, and learned Sanskrit, Hindi and Tamil. 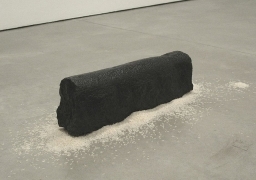 In 1982 he exhibited at documenta 7 in Kassel, and in 1986 his first official solo exhibition was held in the Musée d'art moderne de la ville de Paris. 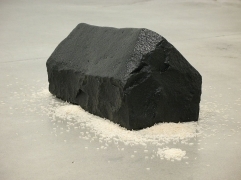 In 1987 he was represented once more in Kassel, at documenta 8. Following were major exhibitions in the Kunstmuseum Bonn (1992), Museum of Contemporary Art in Los Angeles (1992), Kunsthaus Bregenz (1999/2000), Hirshhorn Museum/Washington DC (2002), Dallas Museum of Art/Texas (2002), Haus der Kunst/Munich (2002/3), Fondation Beyeler Riehen/Basel (2005/06) and Museo Nacional Centro de Arte Reina Sofia, Madrid, Spain.